Parents threatened to withdraw their children from the school to avoid being taught by who they called 'a cursed teacher'. 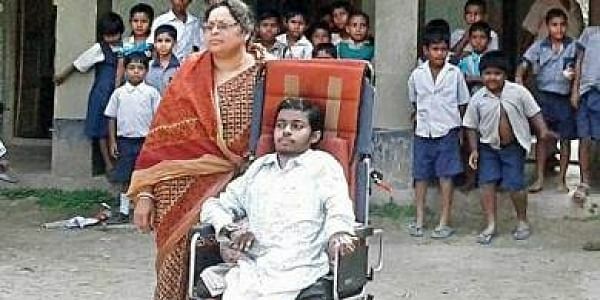 KOLKATA: Ostracisation of persons with disabilities took new heights when parents of students at a teacher-deficient school in Raidighi in West Bengal's South 24 Parganas district protested against the appointment of a qualified young man in wheelchair and threatened to withdraw their children from the school to avoid being taught by who they called 'a cursed teacher'. When Arnab Haldar, a graduate in History, who had also qualified the Teacher's Eligibility Test (TET), came with his parents to Raimanikhakhi school in Raidighi to join as the third teacher in the 60-student school, he was greeted by a group of 25-30 angry protesters who said they did not want their children to be taught by a 'cursed' disabled teacher. Some of the protesters also threatened headmistress Rekha Kansari Purkait of 'dire consequences' if Arnab was hired. However, after several phone calls from the West Bengal Board of Primary Education and visits by around 30 teachers from several schools in the neighbouring villages, Arnab was finally hired and all formalities were completed by Friday afternoon. District Magistrate P.B. Salim and Trinamool district president Sobhan Chattopadhyay also assured all help to Arnab. However, the headmistress, who is a local villager, expressed concerns over the possibility that the parents might retaliate against the appointment later. Arnab was diagnosed with rheumatoid arthritis when he was ten. Over the years, both his legs and left hand became paralysed. He does all his work with his weak right hand. "I told the protesters to give me one day to so that I can prove to them my competence. I have a laptop and I do not have any problem in speaking and hence teaching either. I would teach my students well. But, they just wouldn’t listen to me," Arnab said. Resident of neighbouring Chapla village, Arnab's father Ashish Haldar is also a teacher. Both the parents, who had accompanied Arnab were baffled and sad over the public reaction to their disabled son's appointment.